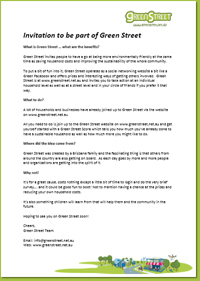 The whole idea of Green Street is to get something going on a neighbourhood or friendship circle basis. Sometimes this may start with just one or two people who sign up then encourage others to do the same. The prizes for reductions by households, streets and businesses are a nice incentive. Simple ways like just chatting over the back fence are often the best. Yet sometimes a well organized street or town event can get people involved while having a bit of fun and perhaps meeting people they haven’t met before. This is a beginning list only - you may have better ways of getting Green Street going in your neighbourhood. Green Street corner meeting or street party - meet in a park or on a street corner to share ideas on how to reduce carbon emissions. Maybe have a local ‘sustainability’ person come to start the chat. Green Street Kitchen Conference - instead of meeting in the park why not meet in someone’s loungeroom/kitchen or household space. Green Street Café - organize an informal gathering at a local coffee shop where the conversation on household sustainability and plotting your moves to win a Green Street prize for the street. Get organizations involved - your local school, Progress Association, Climate Action Network, service club, community organization or business may be only too happy to organize Green Street events if you are not able to do so yourself.